We're proud of our menu, and we're really excited when we get feedback from our customers. 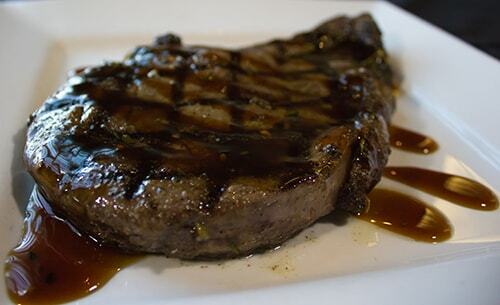 Our 14 oz rib-eye steak grilled to perfection, served with Thai teriyaki sauce. A favorite from the SKY Steak and Grill section! 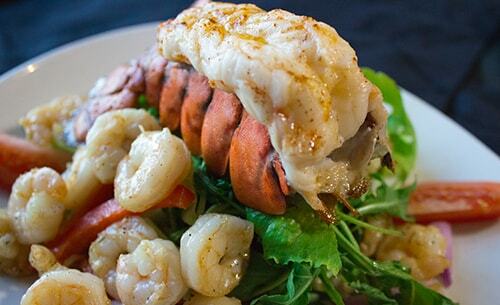 Steamed Maine lobster tail and shrimp sautéed in garlic and poured over a mix of arugula and romaine with red pepper, red onions and scallions, and finished with tomato spears with a honey vinaigrette. 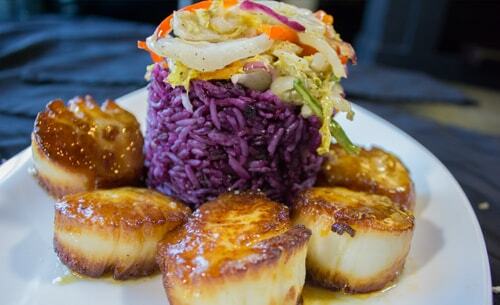 Pan-seared sea scallops drizzled with sweet coconut sauce and served with blueberry jasmine rice and sautéed julienne vegetables. 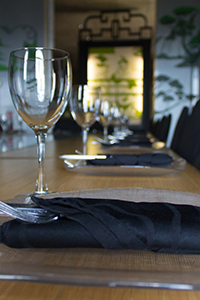 Our exquisite private dining room, the Panda Room, is able to accommodate up to 20 people for any personal or business event. Amenities include Photocopying, Free Parking, WiFi, and Presentation Technology. Our Executive Chef will be happy to create a customized menu, featuring your preference of acclaimed steaks, wok dishes, fresh seafood, side dishes and desserts. 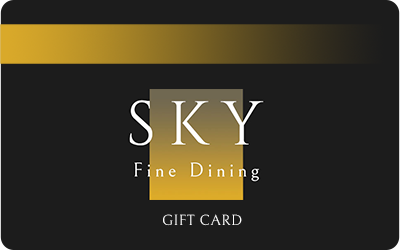 Give the gift of SKY Fine Dining to your colleagues, loved ones, family members, and friends. Make it a dining experience to remember, and one that they will thank you for in the years to come! For information regarding gift cards, please call(352) 291-0000 or emailsky@ocalainn.com. 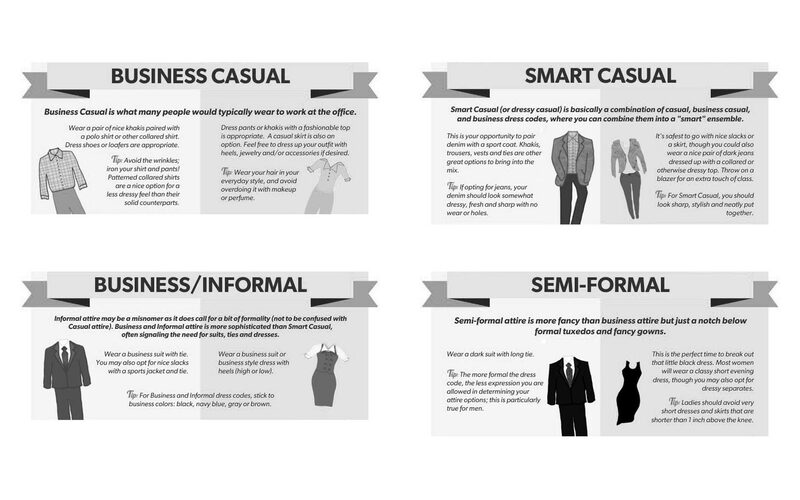 The appropriate attire at Sky Fine Dining is business casual to semi-formal. We ask that no t-shirts, tennis shoes, flip-flops, shorts, or blue jeans be worn. If any of these items are worn to the Sky Fine Dining establishment, you may be seated in our lounge area instead of one of the dining rooms. 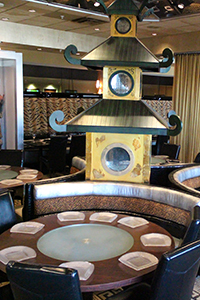 Come experience the most luxurious dining experience in the Ocala area. Sky Fine Dining is a restaurant where great steak is the passion, steaks are the finest U.S. Prime Beef known for its excellence in marbling, texture and flavor. Sky Fine Dining restaurant located on the 6th floor of the Holiday Inn Suites in Ocala. The eclectic gourmet cuisine and steakhouse concept is inspired from current trend and classic dishes like Fresh-cut steaks, live Maine lobster, rack of lamb, and fresh seafood such as sea bass, lobster, salmon & shrimp. The 7 consecutive year (2010 to 2016) Golden Spoon award-winning restaurant, is a place to be for a one of a kind fine-dining experience. 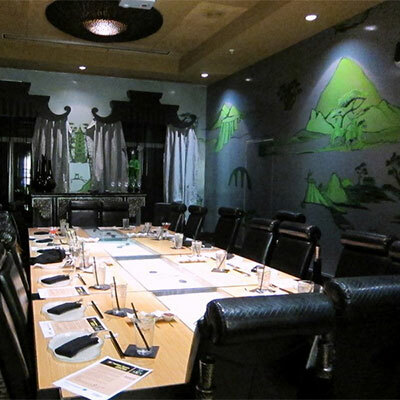 Our exquisite Panda Room(Private Dining Room) is able to accommodate up to 20 people for any personal or business event.